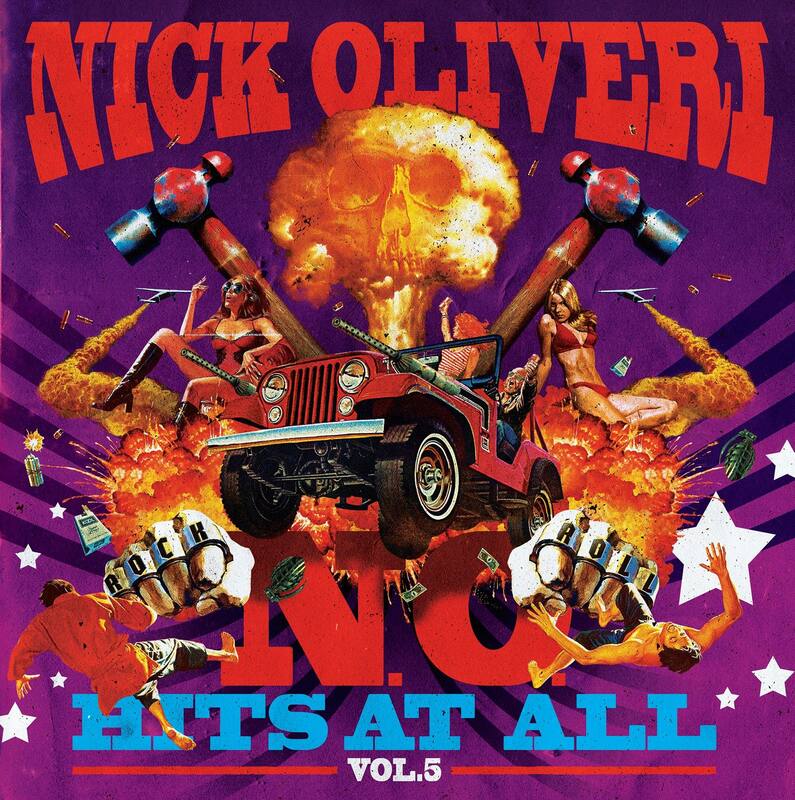 The fifth episode of NICK OLIVERI’s « N.O. Hits At All » series – compiling rare and unreleased songs from his numerous projects and collaborations over the years – is streaming in full today via Riff Relevant. The album comes out this October 12th via Heavy Psych Sounds Records. NICK OLIVERI is an American musician from Palm Desert, California. He plays bass guitar, acoustic guitar, electric guitar, and is a vocalist. He is most widely known for playing bass in Kyuss, Queens of the Stone Age, and Dwarves, and has also performed with the reunited Kyuss under the names Kyuss Lives! and Vista Chino. As a band leader, his main project is Mondo Generator, a punk/metal hybrid that he formed in 1997. Born in Los Angeles, Oliveri began his career in 1987 with John Garcia, Brant Bjork, Josh Homme and Chris Cockrell under the band name Katzenjammer. In early 1989, after Oliveri’s departure, the band would change its name to Sons of Kyuss, later shortening the name to Kyuss. He later rejoined the band, playing on the albums « Wretch » and « Blues for the Red Sun ». Oliveri would leave Kyuss again in early 1992, shortly after his father died in a car accident. Following this, he joined The Dwarves as an on again off again bassist under the moniker Rex Everything. However, he is perhaps best known as a member of Queens of the Stone Age from 1998 to 2004. Oliveri is also a solo artist and frequent contributor to his friends’ albums and tours, including Winnebago Deal, Mark Lanegan Band, Masters of Reality, Turbonegro, Moistboyz aka Dickie Moist and the O.T.C., and The Knives. In the past he has been involved with « The Desert Sessions » Vol. 4 and Vol. 6. He is also one half of the acoustic duo The Uncontrollable, with The Dwarves frontman Blag Dahlia. Cali rock freaks GLITTER WIZARD unveil album details + new track premiere ; ‘Opera Villains’ out on 4/20 via Heavy Psych Sounds. Heavy Psych Sounds sign Germany’s stoner rock gem MOTHER ENGINE ; third album due out this fall on the label. Brant Bjork, Belzebong, Black Rainbows, The Necromancers to play HEAVY PSYCH SOUNDS FEST in Innsbruck this November ; pre-sales available now!